Former Utah Gov. 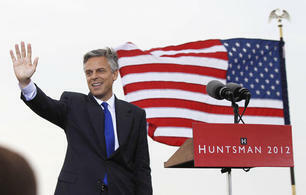 Jon Huntsman Jr. picked up a Bush endorsement in Florida in his quest for the Republican presidential nomination. Jeb Bush Jr., youngest son of former Florida Gov. Jeb Bush, said Wednesday he's backing Huntsman. The younger Bush said he supports Huntsman's focus on turning around the faltering economy and creating jobs.